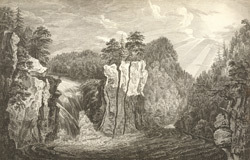 View of the Passaic Falls in Northern America. The Great Falls are the second largest falls in America (only exceeded by Niagara), and stand to a height of approximately 77 feet, and are 280 feet wide. The artist Paul Sandby (1730-1809) was a well known watercolour painter from Nottingham. He was a founder member of the Royal Academy together with his brother Thomas and Richard Wilson. Sandby moved away from the direct representation of isolated buildings and antiquities to embrace the whole landscape and its inhabitants. He was one of the first artists to use the aquatint technique.